There are a lot of things to see so we should start early. Hotel is in 77th Street, so we should walk to 79th to take the metro to 42th, in same line after purchasing a ticket for 24 hours. 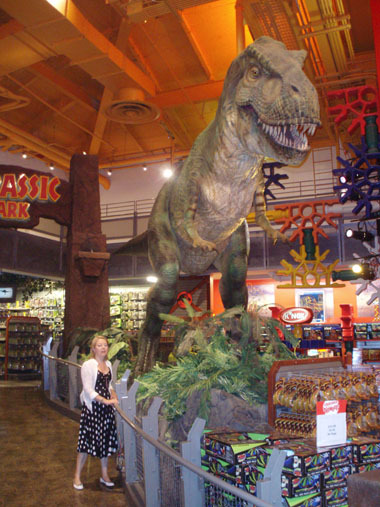 There we will find Times Square with the Toys’R’us store which pictures I could see looked amazing. Two blocks from there we can find Bryant Park, in front of the Public Library and, after it, 5th Avenue. 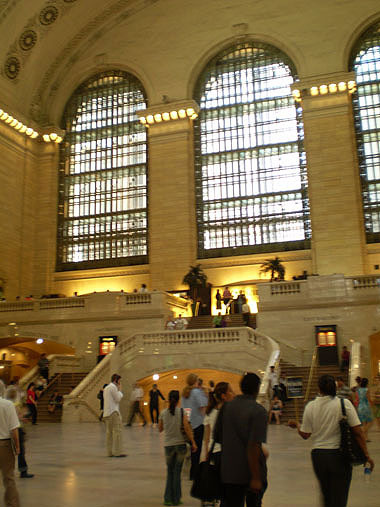 From this spot, depending of the time and tiredness we can walk down to Empire State Building and Madison Square Garden for a long way to South or go straight to East for visiting Grand Central Terminal. 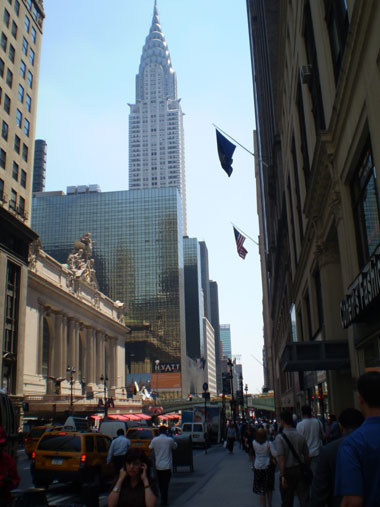 Then, we can walk up 5th Avenue or taking metro but we will end in Rockefeller Center. 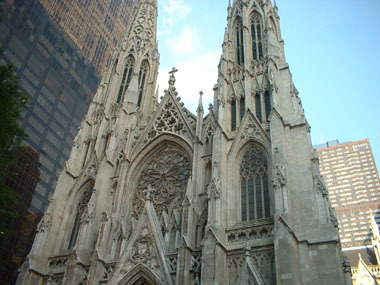 In front we have St. Patrick’s Cathedral and in the center we will need to look for the way to go to Top of the Rock to enjoy the views from there. A little more northern there is MOMA where we want to see Dali’s painting “The persistence of memory”, but just few days before leaving we could read this specific painting is handed over an exhibition out of the country. The idea is going as closest as possible of Central Park. There are two stores I’m interested on: FAO Schwarz, the toy stores where Tom Hanks played a piano on the floor in movie “Big”, and the modern Apple store, where I want to look after purchasing an iPhone. We could go out at night for a dinner, may be on “Riverside”. We don’t like to wake up too early so we go out from hotel at 10:00 and, as this is the only hotel in this travel without breakfast included, we do a quick stop on a patisserie in our way to the “79 St” metro station. There is no ticket office but it is easy getting your tickets from the machines. I use my credit card for buying three 24h tickets by 7.50$ each and we use them immediately for accessing to the station. These metro stations are different than the ones we’ve seen on other countries: it seems uncompleted. Then, once you’ve used to them, they’re more functional, I mean, there are no additional details. You can see the cement, the girders,… The trains look metallic outside, primitive. 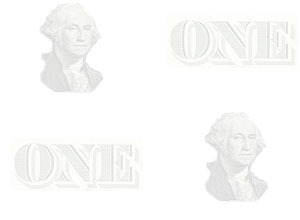 All this design – or lack of it –, being clean as it is, has its charm too. The way is not long, just 5 stops, but when checking the metro map I’ve got I can see there are two kinds of stations: the ones where express trains stop and the ones they don’t, which are the most of them. 79 St., the station we come from, belongs to this last group, but if we had walked until 72 St. station, we would be able of taken an express train and the distance for this trip would be, obviously, the same, but only one stop. I keep this in mind for tomorrow’s trip. We go up to outside from 42 St. station to a narrow street full of theaters: Spamalot, Phantom of the Opera, etc… It seems all of them are here, but the name of the street is not Broadway, but 42. Before going to the map to check where we are, we can see, at the end of the street at our right, part of big screens with people. I think that’s Time Square, so we go to there . We stand open-mouthed for some seconds. Times Square is spectacular in the exaggeration. 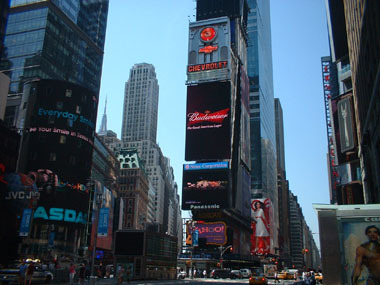 It is a city square saturated of commercial displays, whether in vinyl or big screens. The skyscrapers become mere advertising mains or even screens with news or tv shows. “They’re gone too far!” or “They went nuts” could be typical thoughts when coming here the first time. The amount of yellow taxis is big too. You could be watching the live of this place for a while. This is the most dynamic place I can even imagine, as all the screens are changing their contents they can even change the general colors from one minute to the next. 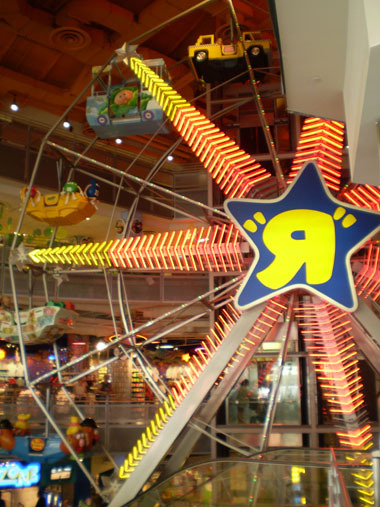 I’ve seen Toys’R’us store across the street, so I know where are going to be addressed our next steps. “This is not a store” is what we say when coming in and met that big wheel with lights. There are some circled floors with a big hole in the middle of them where they’ve set a real size big wheel. The first one I’ve ever seen indoor. Then we spend the time enjoying the departments of this store. First we see the hundreds of plushies of all kind and size, then we pass under Superman saving a track in the ceiling, it’s Marvel area, where we can see Spiderman too and the custom and a replica of the batmobile from the last movie: “Batman Begins” and, of course, there are hundreds of action figures of every hero on sale. We can do a lightsaber fight on Star Wars department. Then we can hear a kind of roars and we find Jurassic Park door, guarded by a real size mechanic Tyrannosaurus Rex. Amazing! On Lego area there are big sculptures built with this toy as an Empire State Building with its King Kong, the statue of Liberty or Chrysler Building, among others. We pass by what would be Barbie house it she was 1.70m high. Finally, we leave the store with a plushie and a 50 cm Darth Mouth sculpture by three times less than its price in Barcelona. We’re still in Times Square when we stop on a typical Hot dog cart and eat one by 1.25$ each. It’s a kind of second breakfast for helping us to cover the block – horizontal size – to Bryant Park. The park is small but beautiful. It’s a square of grass surrounded by trees, over the top of which, you can see the skyscrapers, and the Empire State Building among them. That’s exotic for us. This park is in front of the Public Library and, therefore, is a green area dedicated to the reading. There are a lot of books available for the people and chairs to use for reading them. This park ends at 5th Avenue, so I need to decide what to do next: taking the metro to go to Empire State or Flatiron buildings?, but that would be more appropriate tomorrow; walking 5th Avenue up?, but we’re far from the stores area; or reaching Grand Central Terminal. We choose this last option because is very much closer, because it’s the only one without question marks and because Chrysler building views are calling us to get closer. So we walk one more horizontal block where we can see the facade of the station along with the prettiest skyscraper of the city. It’s the picture at left. Somehow, at this moment I find one of the main problems when planning a tour with my wife: shoe shops. We wait eternally outside the shoe shop for her going out with the chosen pair, so we go into Grand Central Terminal at lunch time. Outside, it has a classic facade chased by the higher buildings around, inside it is spectacular. All is built in white marble (or, at least, it seems so) and the ceiling is painted with the stars on a dark blue sky, with the constellations marked on it. A lot of people are walking around, in and out. On the staircase in picture above at right happened the famous scene of ”The untouchables” movie where a baby carriage is falling down through them in the middle of a shootout. There are some stores and do some shopping in them. We’re tired, hungry, carrying big shopping bags and in front of a metro station so we decide going to the hotel and lunching around it. After resting a little bit on our rooms we lunch in a nearby restaurant. It looks like the typical American bar but all the staff is Chinese. One main dish with meat, rice and calamari it’s around 5$ per person, so a cheap lunch. 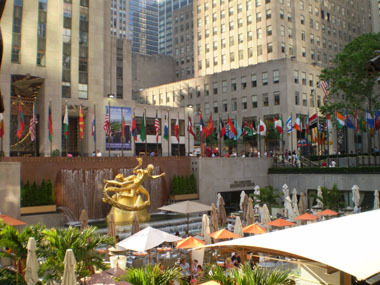 Now we’ve got enough energy as per going on with our visits and in 5th Avenue taking the metro (orange line from 81 St. station) to Rockefeller Center. 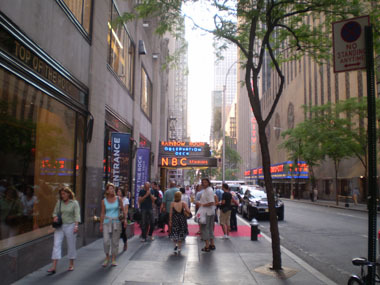 We can see the cathedral immediately, but we’re not sure what Rockefeller Center is on this street. St. Patrick’s is really special. When the usual is get impressed about the magnificence of a cathedral, in this case, the feeling is different as it is the smallest building around. I can recall Gotham Cathedral from Batman movies on it. We take a look inside, but their celebrating mass and we don’t want to disturb. We go across street as Rockefeller Center entrance should be somewhere over there. We take a kind of corridor between tall buildings with garden and fountains. Effectively, the typical item of this place appears at the bottom of this pass way: the golden Prometheus. This spot is famous because of the ice-skating rink is set here in winter but, what is it in summer? Well, it is a bar. Skaters are exchanged by people drinking cocktails and we join to this last group. We’re served with our fresh juice mixes with a bit of alcohol. We can enjoy our rest here. Although it’s not as hot as in the previous cities, it is. My theory is we’re walking between the highest buildings, which are always shadowing the street and making it less hot. After finishing our drinks we walk around this square. We get into the biggest building with a spectacular door, but it’s just a superintendent and a row of elevators in there. It’s not here!. None of the buildings around are for tourists and we cannot find the shopping mall I know is somewhere here but, as what we’ve found indeed is the Top of the Rock ticket box, we get three tickets by 20$ each. We follow the indications from the woman in the box and get into a street we can reckon from some movies and series. There are some “Radio City” neon signs across the street and, on our side, “NBC studios” and “observation desk”. There’s where we’re going! Before taking the elevator we’re passing through a radio city exhibition and, just at the end of it, we’re asked to pose seated on a girder with a black and white picture of Manhattan from a skyscraper. I think they’re trying to emulate the famous photo of the workers lunching on a skyscraper. As we know they’re going to ask a fortune for this photo we don’t pay so much interest on our posing. The quick elevator trip is one of those amazing things you don’t expect: they put images on the ceiling as if it was a video clip playing on a screen with psychedelic music but the tricky part is it is kind of transparent and allow to see, at the same time, the lights on the elevator hole showing how fast it is running through it by being over seventy something floors in a few seconds. So you go out from it thinking about what you’ve just experienced, but not for long as the views of the city are there for you at that same moment. The balcony is upstairs and we go up to there in order of enjoying what we can already see through the windows, which is wonderful. 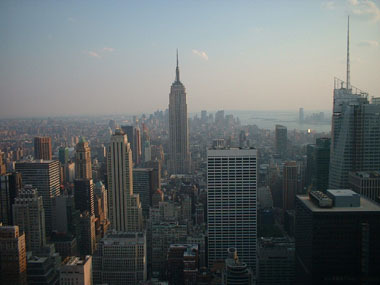 I could see a kind of discussion about what spot has better views: Empire State Building or Top of the Rock. I choose this last one because these main reasons: it’s cheaper, you don’t have to spend a lot of time waiting in a row and this skyscraper is quite ugly. What’s that last reason? I can explain: this skyscraper at Rockefeller Center is quite sober as the Empire State Building is majestic and should be a highlight of any Manhattan view. The only spot where you cannot see Empire State building is actually from itself. Also, there are no views to Central Park from it as the ones here are amazing. The cameras are working hard here. This observation desk is an opened and broad area with a kind of glass wall high a little more than a person as only separator to the deeps but offering no problem for sightseeing. There are some wood bench for resting and some vintage telescope viewers around. We spend a lot of time here enjoying the views to the four cardinal points as it’s difficult to leave such a beautiful place. Even we play with the camera zoom for taking a good picture of St. Patrick’s Cathedral far down, with that cross projected by all cathedrals to the sky. This is one of these visits you leave thinking you’ve already seen everything in this city, but there are actually still two dense days in front of us. The time spent up there has made us being back at 5th Avenue at 19:30h, so we have 30 minutes before stores closing time . This is the transparent cube, with the Apple sign from down, once in the lift. The store is big, full of people testing laptops and iPods displayed for public use. I go to a desk to get a confirmation about what I could read before: there is no iPhones. They’re waiting for the release of the new 3G models on July 11th and, until then, they don’t have any iPhone in any store. So, this is over as we’re not going to be in USA by then. When we leave the store is completely dark and we’re tired, so we take a taxi to the hotel. Metro in Manhattan is fast but has a problem when you require a horizontal move as lines go across the island vertically with just a few exceptions and you need to change lines at least twice if you want to go East to West or vice versa. This journey is completed. One more visit to the store from yesterday and dinner at room.